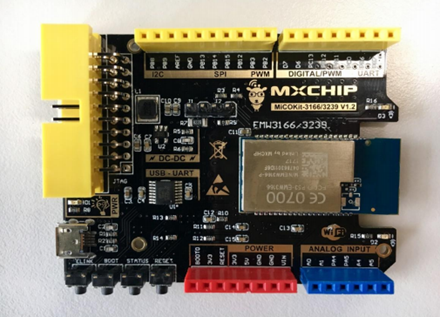 MiCOKit from MXCHIP is one development kit based on MiCO. It could be used for the development of smart devices and the demos. This development kit provides one easy solution for developing smart devices. And it’s convenient in achieving the applications of users. The kits include hardware, software and community parts with MiCOKit development board and the demos about how to connect to cloud platform to achieve the controlling by mobile phone. Power supply: Micro-USB 5V with one DC-DC onboard 5V-3.3V. The functions of the pins on MiCOKit main board could be distinguished by color. Yellow is for digital signal pins, blue is for analogue signal pins and red is for power supply. MiCOKit uses USB as the power supply and serial communication, and one high efficient DC-DC (TD6817). TD6817 is one monolithic synchronous buck regulator with high efficiency (96%) and constant frequency (1.5MHz). The output voltage has three types: changeable, stable 1.5V and 1.8V. The maximum output current is 2A, while the static loss is just 20uA. The output voltage 2.5V-5.5V is suitable for the power supply of single lithium battery. The switch frequency is set as inner 1.5MHz which is convenient for small SMT inductor and capacitor. It has the function of over-temperature protection.